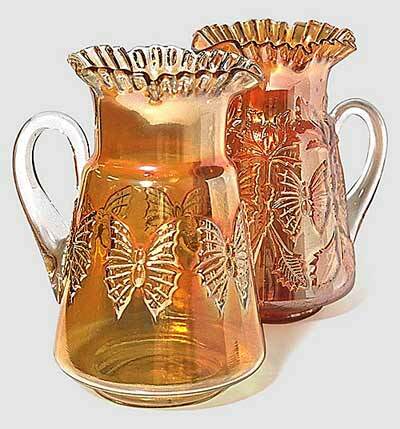 The pitcher toward the front lacks all the design except for the butterfly. Speculation is that this was an early test version and that Fenton decided it looked too plain--so they added the ferns and plumes. This unusual pitcher sold at auction in 2005 for $800. The pitcher behind is the one usually seen. These two were photographed while in the collection of Carl and Ferne Schroeder.